The Rochester Public Library District (RPLD) is expanding. What will happen? The RPLD will more than double in size! The RPLD is adding space for books, services, programs, and meetings! Property taxes are estimated to increase by approximately $10-$12 a month for a home with a $200,000 market value. Multiply your home’s value by 0.00072 to approximate idea of how much your taxes will increase. Will the library be closed during construction? The library intends to remain open during the construction period maintaining all regular programs and services. Should a temporary closing be needed, you will know well in advance and why. How will the decision to expand be made? 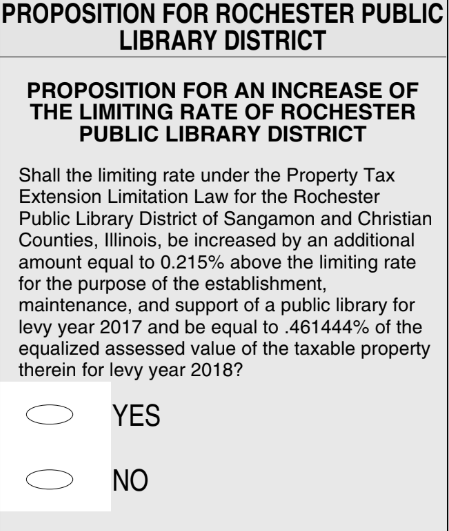 Voters in the Rochester Public Library District will vote on a tax increase to pay for the expansion. The referendum will be on the November 6, 2018 ballot. Why is the additional space needed? Population has grown, since 1990 by 36%! Library visits increased over 200% in the last 5 years. From what sources does the Rochester Public Library District (RPLD) derive its revenue? The RPLD derives its revenue from property taxes, fines, grants, and donations. What kinds of additional spaces are being added? Providing the community access to new technologies, create things, collaborate with each other, be exposed to new ideas, and access to office equipment to support local businesses via an innovation lab. A safe space for teens to study, play, learn, socialize, create, and contribute to the community. Co-teaching spaces where tutors can teach students in a quiet setting. Video gaming area particioned off for complete noise control. host Science Fair for homeschoolers. Welcoming all families and their children to play, learn, and grow. An adult quiet area to where adults can read, explore, and meet in small groups. Housing Rochester’s existing and expanding local history collection.